HotStart installation of our WordPress themes is the fastest method to install any theme together with demo data that you’ve seen on our demo server. HotStart is actually a new WordPress installation that includes the theme and all plugins. You would probably need to test our theme on your localhost first or you may need to develop entire site locally and then to move to the live host. 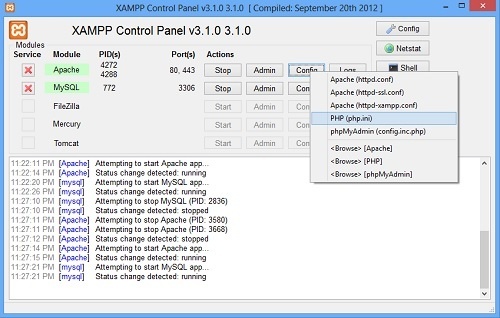 In both cases, you probably installed XAMPP, WAMP, MAMP or similar application on your PC or Mac. These applications are actually emulators of the server environment based on Apache that you need to run WordPress locally. After the initial installation of such piece of software, your virtual local server could be ready immediately, but in some occasions it may need some tweaking. Two settings that most commonly makes problems with running larger websites on the local environment are PHP settings located in file php.ini. PHP is scripting language needed to run WordPress and it’s part of the server emulator’s package. You should find php.ini file that’s used by your local server. If you can’t point it, please check virtual server’s documentation. They are located somewhere in the php.ini file and usually, after initial server installation, they are set to 128M (megabytes) and 30 (seconds). If you couldn’t install our theme with HotStart method, you were most likely stuck in the part 2. In this part, your server is copying a big SQL database file. To solve this problem, edit your php.ini file and increase memory_limit to 512M (or more) and max_input_time to 60 (or more). After that, restart your virtual server (or restart your computer) and try HotStart installation from the beginning. For more details about the HotStart installation, please read documentation. It can be downloaded from the same place where you downloaded your theme.